One great thing about insects and spiders is that they can be found almost anywhere. One great thing about kids is that they love to explore. Putting those two together creates a terrific way to get kids interested in nature. It’s been fun watching my kids explore our yard – let alone the prairies I drag them to. I’ve tried to foster a sense of discovery and excitement about the kinds of creatures we can find all around us. I’m not an entomologist, but I’m enthusiastic – and we can find an insect in the yard and learn about it together. I don’t care whether my kids grow up to be prairie ecologists or not, but I do want them to grow up with an awareness of the world around them. Insects are an easy and accessible place to start. My son Daniel with a katydid nymph he found in our yard. This entry was posted in General, Prairie Insects, Prairie Photography and tagged children, conservation, insects, kids, kids in nature, nature, outdoor education by Chris Helzer. Bookmark the permalink. Chris, I love this blog. Keep up the good work! 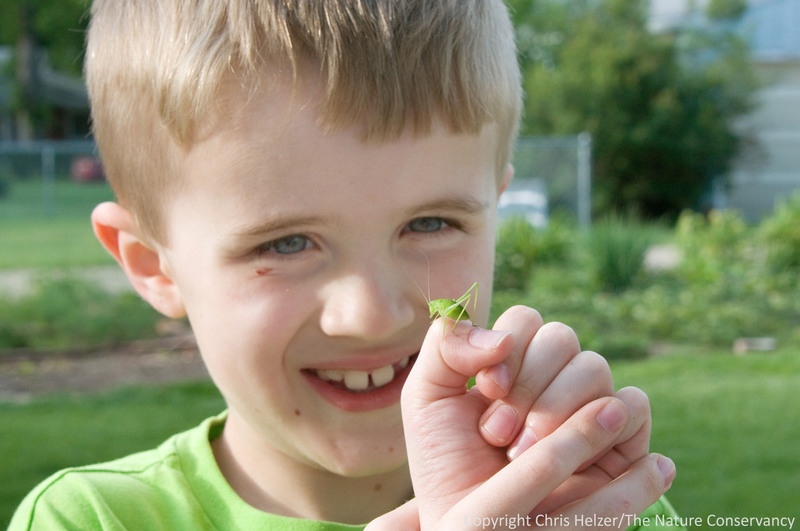 Working with kids at the Lincoln Children’s Zoo Butterfly Pavilion confirms the above , just how easy it is to get kids excited about nature, via insects. They are so plentiful, easy to find and easy to work with. There’s a new discovery about any place you look! I think that is part of the reason why you’re seeing more zoo’s with arthropod exhibits! You don’t need big animals to get attention, the small things out there can be just as interesting!